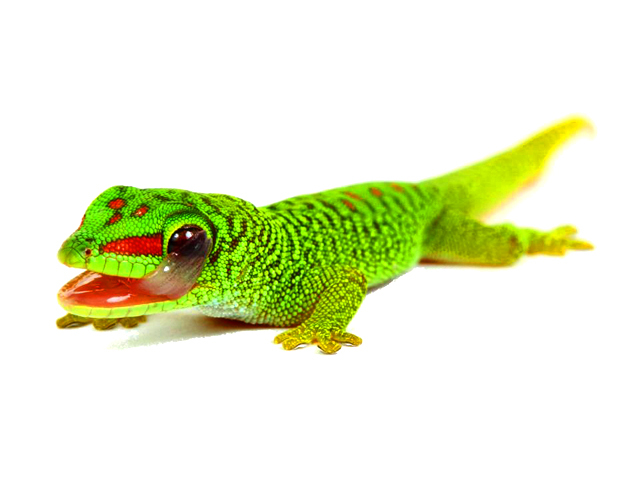 Phelsuma grandis is a diurnal arboreal species of day gecko. The body colour is bright green or, rarely, bluish green. A red stripe extends from the nostril to the eye. On the back there are typically red coloured dots or bars. These red markings are quite variable, and in some cases, completely absent, though the line extending from the nostril to the eye is always present. The underside of these animals is a creamy white ranging to an eggy yellow. When stressed, the colouration darkens, rendering the whole animal a dark green, and the red markings on the face and back more orange in hue. You can see in detail how beautiful these lizards are in this video from Exclusive Herps. The terrarium that will host your Day Geckos should not be less than 0.45 x 0.45 x 0.6 meters (LxWxH) (1.5 x 1.5 x 2 feet) for an adult. The nature of the terrarium also plays an important role in making the animal feel comfortable so it is important to ensure that the interior is homely for the Geckos. The Phelsumas are found in habitats with lots of bamboo and broadleaf plants, so a terrarium with bamboo reeds will make the animal feel more secure and will have the option of hiding. Plants which have proven to be suitable for day Geckos are; Sansevieria trifasiata, Ficus elastica, Strelitzia reginae and Monstera sp. None. Live plant cover is ideal for hiding. The substrate helps to retain moisture. Use peat or soil. The substrate should be 6-10 cm in order to absorb the water from the spray and not retain it. The ultraviolet light can be provided with lamps that produce radiation UVB 5:0 for reptiles living in tropical zones which must be on 10 to 12 hours a day and switched off at night. The irradiation lamps are used for the synthesis of vitamin D3 in the body of the reptile. The ambient temperature should be between 25-30 °C (77-86 ºF) in the terrarium and 35-40 °C (95-105 ºF) at the basking spot. A spot lamp will help to create these temperatures. At night the ambient temperature should drop 5-7 degrees (C) (9-10 F degrees). Hydration can be provided by spraying the animal and leaves in the terrarium daily with water, making sure that several drops will stay in the terrarium for the animal to drink as needed. A lot of keepers use a water bowl but not all Phelsumas adapt to this (of course without excluding the daily sprinkling). Humidity must range between 55-75% which can be maintained by keeping living plants in the terrarium. Both the plants and substrate must be sprayed with water daily to keep the humidity levels habitable. The Phelsumas feed on insects such as crickets, grasshoppers and mealworms. You can also give them fruit creams, honey and organic yogurt mixed with fruit such as mangos, pears, papaya etc. Insects must be dusted at least 4 to 7 feedings with calcium and vitamin D3. Infants must be fed every day while adults need to be fed every three days. Handling is not suggested due to the animals’ sensitive scales, which can be injured very easily. In certain cases you will notice that some animals of this species will accept being handled without having being handled previously. Purification of the substrate and terrarium should be performed every one to one and a half months. Feces must be removed daily from the terrarium. During the shedding period ensure that the humidity is raised and the animal is sprayed more often as the Phelsumas (like other geckos) eat their skin because it has nutrients. Giant day geckos appear to be hardy animals in comparison with other reptiles. This factor should not be an excuse for mistreating or inappropriate care of the animals.